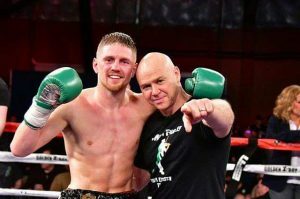 Jason Quigley defends his NABF Middleweight title on Thursday night against former world title challenger Freddy Hernandez. The fight will be streamed live on ESPN in the U.S and Eirsport in Ireland. Quigley signed with Golden Boy Promotion on turning professional and has fought solely in the United States however he moved gyms last year and now trains at Dominic Ingle’s gym in Sheffield, England. Quigley takes on Hernandez (34-9, 22KO) at the venue he won the NABF title and it is a place he feels comfortable appearing at having done so five times in his career so far. The Irishman feels Fantasy Springs is like a second home now. Quigley suffered an injury against Glen Tapia, the night he won the title and made his return against Daniel Rosario Cruz in March winning by TKO in the 6th round. While delighted when he defeated Glen Tapia to win the title he feels there is more to come on his journey to the top. Quigley faces a tough opponent in Hernandez and I asked him what he knew of his opponent and he agreed this will be a tough test.